FInal DPS ACT Saturday Academy Saturday, March 1--Juniors take the ACT March 4th! The final Saturday for the ACT Saturday Academy takes place this Saturday, March 1. Encourage Juniors to come and learn more about the ACT test subjects and strategies for taking the ACT test. This test is part of North Carolina's NC READY accountability program, but perhaps most importantly, the ACT can be used for college entrance and is given for free to all high school juniors in DPS and in NC. Transportation is available. Many DPS high schools are also offering after school ACT preparation during the week this week. Check with your school to learn more. The League of Women Voters, a nonpartisan volunteer organization, presents a discussion of current education issues facing North Carolina, including financing and charter schools. Dr. Helen Ladd will talk about current issues in public education in NC at 7:00 on Tuesday, February 25th at Extraordinary Ventures, 200 South Elliot Road in Chapel Hill. The conversation will put special focus on the implications of new legislation on charter schools and effects of other state funding plans on public education. Dr. Ladd is the Edgar T. Thompson Distinguished Professor of Public Policy and Professor of Economics at Duke University. This is a great opportunity for parents and community members to learn and engage with the key issues impacting public schools in North Carolina. Dr. Ladd's research and expertise will help deepen our local conversation on these topics. To read more about the event and Dr. Ladd, read the press release on the event. 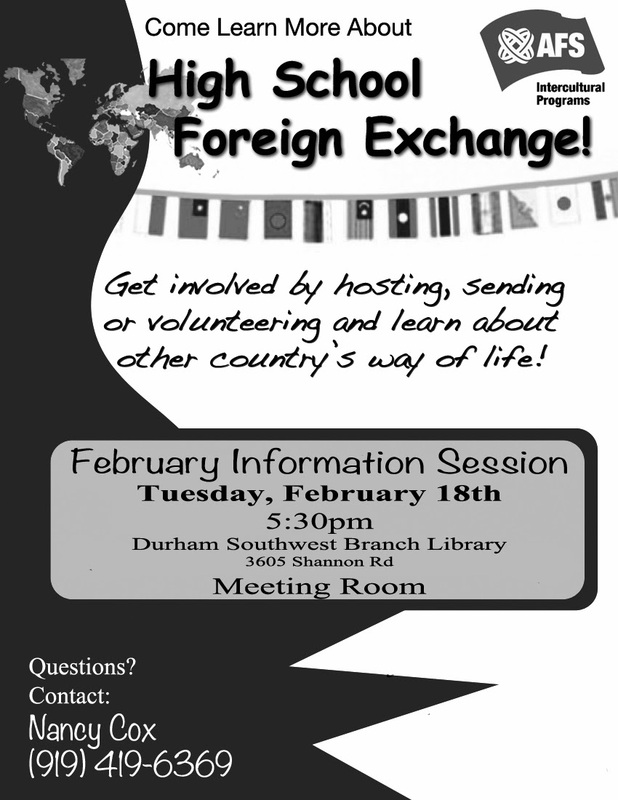 If you have any interest in High School Foreign Exchange whether it be hosting a young person or sending your own child, attend the AFS information session at Southwest Library. In this interactive presentation, Ms. Brodersen will talk about common signs of stress and anxiety in children and adolescents and share simple strategies for how to help your child. Miriam Brodersen is a therapist in private practice in Durham, NC. She enjoys helping children, adolescents and adults learn new ways to manage their difficult feelings and reconnect with their joy and passion. One of Miriam’s specialties is working with young children and their parents. Incorporating information about child development and attachment theory, she helps parents and children connect with one another through play. Miriam also enjoys helping adolescents navigate the changing terrain of social and family relationships. 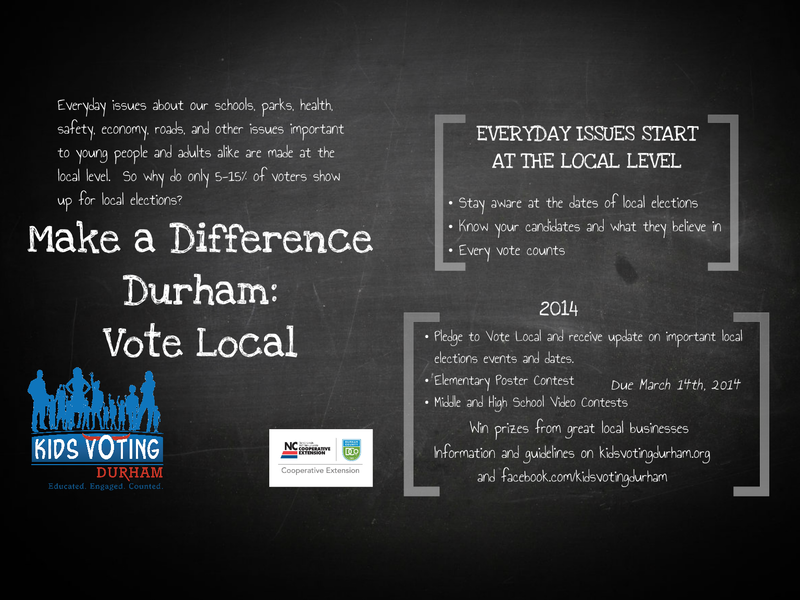 Kids Voting Durham has a great 'Vote Local' video and poster contest. Middle and High School Youth can submit 1-minute videos and K-5 students can submit posters on the Vote Local theme. Individuals and Groups are welcome and there are prizes. Submissions are Due by March 14th. This is a great activity for individual students as well as groups. Any student, public, private, or home school is invited to participate! Go to www.kidsvotingdurham.org for more information about Kids Voting Durham or click HERE for the contest announcement and guidelines. Contact Kids Voting Program Coordinator, Carolyn Kreuger, for more information. Some folks have been asking what we know about the new Charter Schools opening in the area. We don't know much about them other than what they are sharing. We will mention two here with their websites. For 2014-15, there is only one new charter in Durham County called Reaching all Minds that will serve K-3 in 2014-15 and add a grade until it is K-5. Another new charter that might be helpful to mention is Dynamic Community Charter School in Cary as it serves middle and high school children with intellectual and developmental disabilities. Students can attend a school in any county if they get in and are willing to transport their child. There are always growing pains and start up challenges for any new school, so be sure and ask good questions about the site, resources, teaching staff, etc. With charter schools, you also want to ask questions about resources like lunch and transportation that are not often the same as those offered by a regular public school system. Join the North Carolina Youth Conservation Corps (NCYCC) for an action packed weekend of outdoor work and adventure. NCYCC "crews," are small co-ed groups of crew members and two trained leaders that work as a team to complete high priority outdoor conservation projects that benefit the local community. The NCYCC is partnering with the Ellerbe Creek Watershed Association, Eno River Association, and Eno River State Park to offer Durham, Orange and Wake County young people ages 14 to 19 the opportunity to become a NCYCC crew member for a weekend. Crew members will serve from 4:30 p.m. Friday to 4:30 p.m. Sunday and camp for two nights at Eno River State Parks. This experience offers community service hours, a high quality education, and resume building experience. Latino High School Students have a unique opportunity to learn how to better prepare for college and a career in medicine. Participation in the Latino Medical Student Association Conference is FREE for High School Students. The conference takes place February 7th & 8th. • Financial Aid: How to pay for colleges? Advance Registration not required, but available online. Again, this is free for High School Students. When you select high school student, you will see the cost at $0.